If you know anything about the life of Harry Houdini, then you know about his personal crusade to unmask those who claimed to be able to communicate with the dead. What I didn’t know, but learned from this book, is the extent at which this crusade consumed him. Harry’s goal wasn’t just to disprove spiritualism. He truly wanted to believe that you could communicate with the dead. He wanted to reach out to his dead mother. When the Scientific American Magazine decided to offer a $5,000 reward to anyone who could prove that they were an authentic spiritualist, they enlisted Houdini as one of five judges tasked with authenticating or disproving a spiritualist’s claims. The first quarter of this book delves into the how and why the reward offer came to be, the early charlatans who were disproved fairly quickly, and Houdini’s rise to fame. The rest of the book is centered on one specific spiritualist — Margery. The “Lime Street” in the title refers to where Margery would conduct her séances. As I read the book and tried to visualize the various ghostly effects that Margery accomplished during her séances, such as levitating tables and objects, ghostly sounds, cold breezes, etc., I kept seeing Whoopi Goldberg in Ghost and her helpers hidden in the closet. And the house on Lime street did have a design that lent itself to such shenanigans, but the author seemed to downplay that angle and only mentioned outside help once, and that involved servants admitting to being late for a cue to perform some trick for the sitters at a séance. In the case of Margery, most of her tricks were performed solely by her, using whatever appendages the judges hadn’t restrained. I have to admit I had a hard time visualizing a lot of what was going on. When a trumpet mysteriously floats above those sitting at the table, the author claims that Margery would use her head to perform the illusion. I couldn’t see it. I couldn’t visualize the bell that was supposed to ring by mysterious means. I also could not visualize the cabinet in which Margery supposedly conducted all of her séances. As a result, I often went back and forth between believing that she had some kind of supernatural powers to trying to understand what exactly was going on. Margery’s biggest draw was her ability to communicate with her dead brother Walter. He was the one who was making all of the mysterious noises, playing instruments, touching participants, etc. But here again I could not visualize how this was done. I kept waiting for the author to reveal how the room was rigged and someone behind a wall was speaking as Walter, able to move around to make it appear as if the voice was coming from different locations. But the only answer I could derive from the text was that somehow Margery was also the voice of Walter. That didn’t make sense. She not only would have to be able to convincingly impersonate a male voice, but she would also have to have been a ventriloquist as well. There were a number of images in the book, but the images were small on my Kindle and tapping on the image did not bring up a larger image. As a result, I couldn’t tell you who or what was in most of the images. The majority of this story takes place in the late twenties. The popularity of spiritualism came and went by the thirties. But the desire for people wanting to communicate with lost loved ones remains. Just recently a woman, posing as a psychic, was arrested and charged with cheating one man out of $550,000 in his attempts for psychic guidance. As long as there are people looking for answers and spiritual guidance, there will be charlatans ready to take their money. 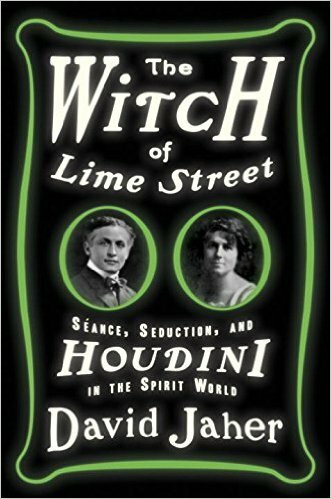 Houdini’s crusade to unmask the tricks of the psychic trade eventually led to him dedicating entire shows to demonstrating how spiritualists performed their trickery. As much as Houdini is known for his impossible escapes, he is also known for his inability to communicate with his wife after his death.